This glove's body is made of cowhide leather. The palm, thumb and base of the fingers are protected with layer of suede leather. 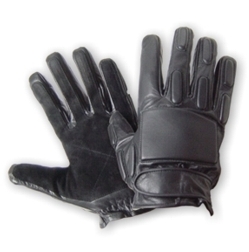 This gives the gloves an unequaled life span and it gives more protection to your hands. The extra padding is really appreciated while rappelling/roping in assault entry situations and it adds friction, yielding better control and your hand stays cool and comfortable. The extra rubber back hand gives you more protection while in rescue conditions.